When it comes to gifts, I tend to like “experiences”. That’s why I was thrilled when my boyfriend decided to take us to a sushi making class this past Sunday to celebrate my birthday. Sushi 101 was hosted at RA Sushi in Leawood, and I must say that Aaron was a good sport being that he was the only male in attendance. Sushi seems to be the happy hour of choice for young professionals, and we can’t wait to try our skills out at our next dinner pary! Plus, many of the options are healthy, although there are definitely “watch outs”. But that’s for another post! We made a traditional California roll, a specialty maki roll and salmon/shrimp nigiri during the class, of course eating along the way. We even got some delicious miso soup, sake, our own sushi rolling mats and gift cards to come back for a free roll. Definitely worth the price in my opinion! If you live in KC, apparently the Oriental Supermarket at 103rd and Metcalf is a good place to start for all your sushi needs. First things first is to always make sure the rolling surface is wet or else the rice will stick. 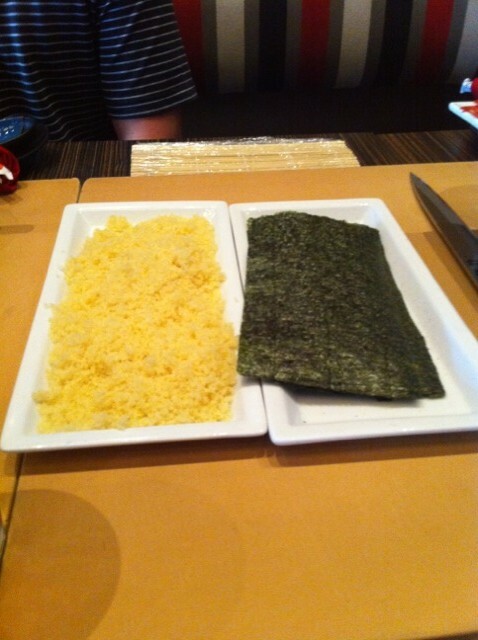 After that, we laid a sheet of nori paper shiny side down on the counter. Now this is where we got off easy. Because of their high production, RA has equipment that rolls out sheets of rice with sesame seeds already on it to help with sticking. We will have to experiment with making this ourselves at some point! 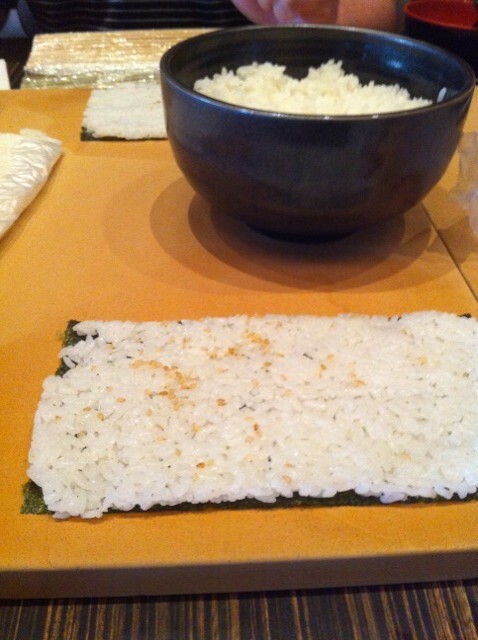 We laid the rice on top of the nori paper and then flipped it over. 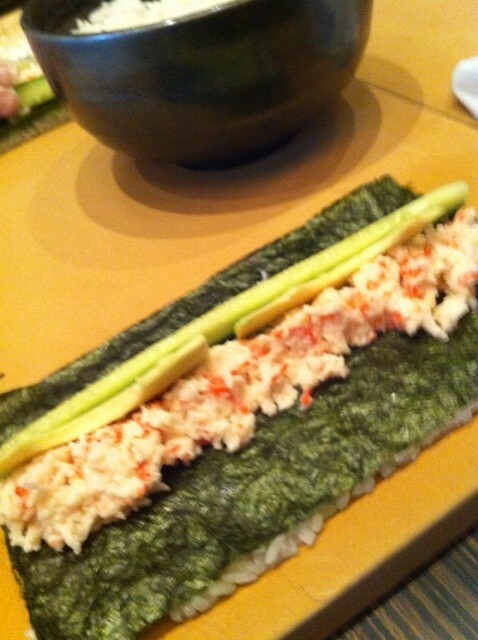 Then, lay the meat (crab meat and later shrimp in our case) directly in the center of the nori paper. It takes a bit of practice to get the amount right so that your roll wraps up well. Then we laid precut strips of cucumber and avocado on top before starting at the top and rolling TOWARDS us. Then, you place the “crease” against the countertop (sorry wasn’t so great at capturing every step in photos because was having too much fun!). Once the roll is all wrapped up (not too tight), then it’s time to use the sushi rolling mat. It was wrapped in plastic so that you can reuse over and over again, just removing the plastic. Shhh…don’t tell…we grabbed a few extra mats. This is where I really need pictures, but essentially you place the mat directly over the roll and squeeze it gently, flipping it over until it is firmly together and won’t fall apart. I should probably mention that we kept wetting the surface throughout. Then, using a special knife cut the roll directly in half using a rocking motion. This is tricky because if you don’t do this, your cuts won’t be straight and your rolls will fall apart. 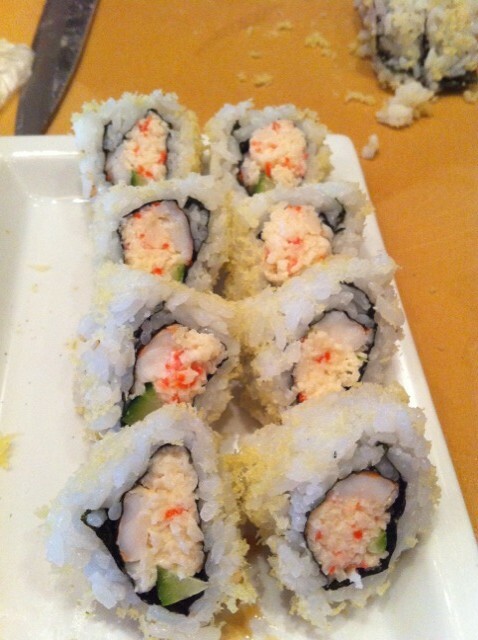 See my plated rolls below (rolled in tempura). This was my second batch and MUCH improved. If you live in KC and are interested in a similar class, RA is offering another one on December 4th. Also check out the Culinary Center of Kansas City for class specials. Ever made sushi? What was the hardest part for you? I’m curious about the rice!